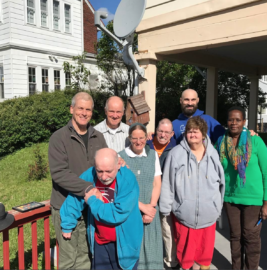 Six members of the L’Arche Boston North community, traveling west from Haverhill by mini-van, reached Billings, Montana, on Monday evening, May 15. This marked the end of the firstweek of the “L’Arche Across America” tour, which will take them 8,000 miles and visit a dozen L’Arche communities in the continental USA. .
For the first four nights, core members Woody, Doris, and John D, and assistants Jane, Webster, and Todd were hosted by communities in Syracuse, Cleveland, Chicago, and Clinton (Iowa), as they moved west. 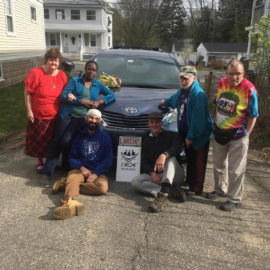 Driving on towardthe Pacific Northwest and four more L’Arche communities in Spokane, Seattle, Tacoma, and Portland, our fearless travelers spent the next three nights (Saturday thru Monday, May 13–15) in hotels in Luverne MN, Custer SD, and Billings MT. What were their favorite experiences? It depends on whom you ask. From day one, Woody has been a tireless ambassador for L’Arche Boston North. He tells countless strangers that the group is from L’Arche Boston North, even if no one he speaks with knows quite what L’Arche Boston North is! 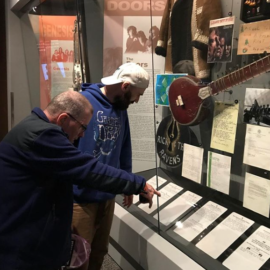 Very often he will tell his newfound friend about the group’s visit to the Rock and Roll Hall of Fame and Museum in Cleveland. It was, Woody says, “right up my alley.” Another comment, soon to follow, is, “It freaked me out.” Highlights were exhibits about Woody’s three favorite rock artists: U2, Patti Smith, and The Doors. The picture shows Woody and Todd discussing the Doors exhibit. Woody’s wife of 26 years, Doris, is also traveling with L’Arche Across America. While Woody is usually quicker to speak, Doris has her own opinions, including those about rock and roll. 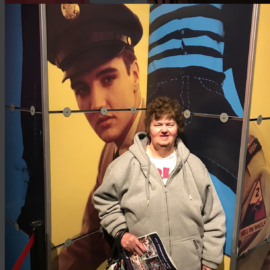 When asked for her highlights of the first week, Doris cited her chance, also at the Rock and Roll Hall of Fame, to be photographed with Elvis Presley. In the van, Doris rides shotgun in the seat beside the assistant driving (Todd, Webster, or Jane). 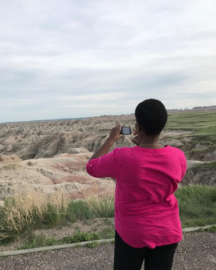 This has given her a clear view of the amazing landscape the travelers have been passing through, and Doris is quick to speak of the cows, horses, and sheep she has seen while in South Dakota, Wyoming, and Montana especially. Doris also had a possibly indescribable experience at Niagara Falls on the second day. This was described in a blog post by Webster. John is the quiet man on board. He sits behind the driver and beside Woody, while the two assistants not driving at any time sit in the “way back.” In fact, John slept many hours in the van during the first few days of travel. 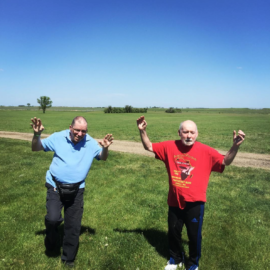 Although he may be diffident about expressing an opinion on this question, John has a quick wit and amazing timing with a one-liner.He is a steadying influence on the whole group, according to Todd, and he can also let loose, as he did with Woody one afternoon on the prairie during a picnic at a rest stop in South Dakota. Jane, originally from Kenya and hoping soonto be a US citizen, was very eager to see the American landscape. And of course thishas impressed her very much, as when she took a photograph of the Badlands at dusk. But when asked about her favorite experiences Jane answered quickly about the group’s amazing encounters with strangers along the route—strangers who quickly became friends in manycases. Jane was most grateful for the hospitality of the Barrons and their openness to speaking about Bruderhof and L’Arche. The photo shows the group saying good-bye to the Barrons on Wednesday morning, May 10. From left: Webster, John, Adolf and Mary Barron, Woody, Todd, Doris, and Jane. Todd cited two highlights out of many: The Badlands and Woody’s uncanny ability to lift the spirits of the entire group. Webster agrees: Woody’s sense of humor and his love for rock and roll have kept the van rocking. This includes a daily CD selected from the bagful that Woody brought along and played quite loud while the travelers are driving, on average, 300 miles per day. Please keep the travelersin your thoughts and prayers. Another update will be filed on or about Wednesday, May 24.